Another baby update already? Yes, friends, another month has flown by and though I sometimes feel these posts only thrill the grandparents and my own desire for record keeping, I continue to write them. Now hold on to your hats, I’m feeling chatty. Kaitlyn turned 7 months old on the 16th. No official photo shoot this month because we are flying by the seat of our pants over here trying to enjoy the holiday season and figure out this ‘throw schedule to the wind’ phase that Kaitlyn seems to be going through. 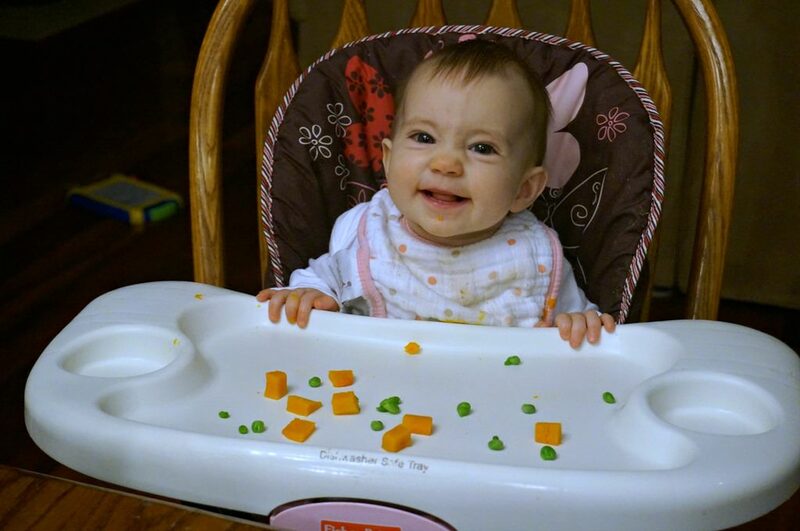 This past month Kaitlyn has really started embracing baby led weaning. She can grab pieces and bring them right to her mouth, which makes eating out more enjoyable because she is distracted. At home she eats solid anywhere from 1-3 times a day, depending on the day. She is regularly eating bananas, sweet potatoes, butternut squash, broccoli, peppers, peas, avocado and carrots, but has also tried pasta, bread, ground turkey, pear, puffs, yogurt melts and shredded chicken. I let her try a pouch (organic peas and mint) and she didn’t really take to it. So far sweet potatoes appear to be a favorite, but I don’t think she really has strong taste preferences at this point. I’d say she nurses 5 times a day (6:15, 9:30, 12:30, 3:15 and 6:15ish), but honestly, right now she must be hitting a growth spurt, getting teeth or something because yesterday she nursed a ton. I was a bottomless pit of hunger and thirst and it felt like the newborn days again. Whatever you need baby girl! She took a bottle well when I was out of town a couple weekends ago and I’m reminding myself I need to keep up the occasional bottle so we can keep that as an option. I can’t blame her for lack of schedule- that’s all on me. 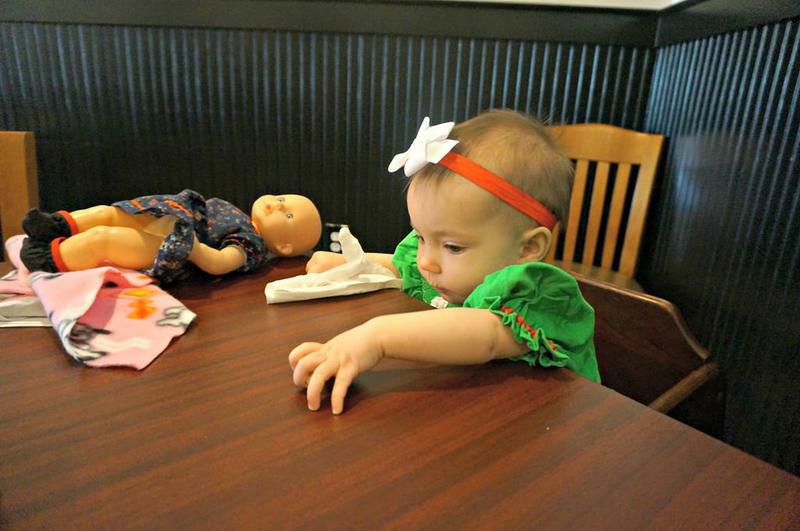 At seven months old, Hailey had a nice orderly little routine. Isn’t that cute? What first-borns get? Kaitlyn is always on the go. Lucky for me, she adjusts well, clocking in cat naps in the car. I know if we are going to leave the house that we need to be pulling out of the driveway by 8:45/9 and she will immediately doze off. If we are at home, she usually takes two naps. One from 9:00-10:30/11ish and another around 2:00 for 45 minutes or an hour and a half. She goes to sleep at night at 7:00pm and though I’d say she usually sleeps until 6:15, this week it’s been between 5:30 and 6. 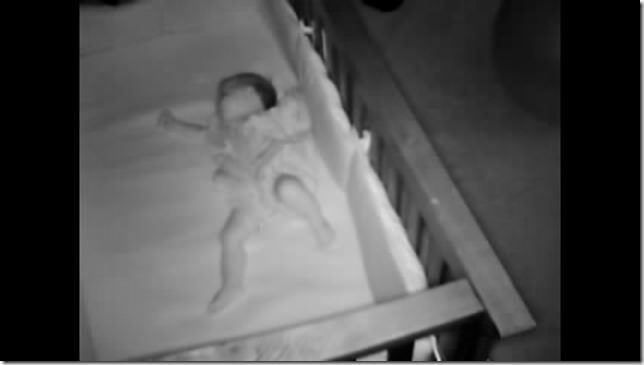 This morning in particular she was up at 3:30, so between the odd sleep and extra eating, I’d say something is going on. 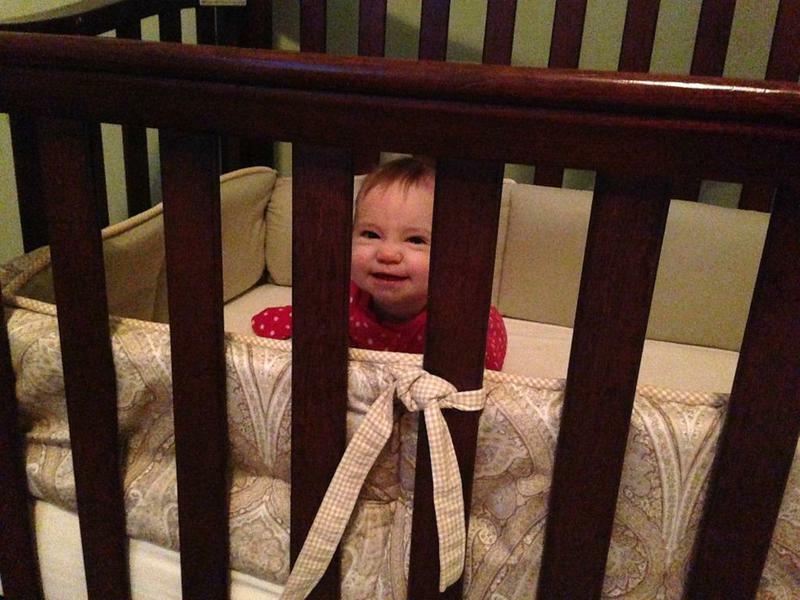 And have I mentioned how much she loves standing in her crib? It’s about time to lower the mattress. Sniffle. Oh that face, I just love it. Kaitlyn is a happy girl. Truly, the child is so cheerful unless she’s flat out exhausted. She crawls everywhere on all fours, but her new favorite is pulling up to standing, then attempting to let go with one hand and turn around. She pulls up on toys, baskets,legs and chairs, which has led to some decent falls. She’s a bruiser. In the last few days I’ve noticed a real uptick in her babbling. I guess I would call it that? 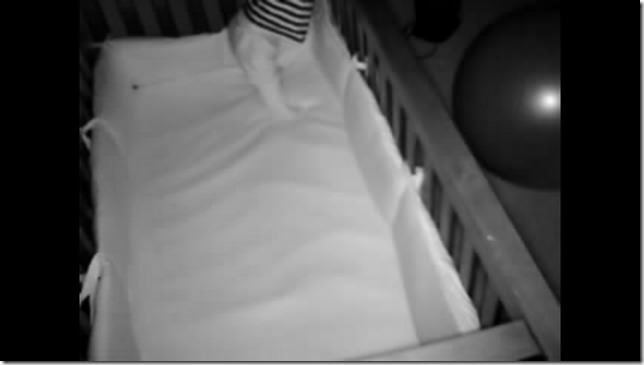 She gurgles and whispers, but I haven’t heard any distinct ‘dadadada’ or ‘babababa’ sounds. I keep trying to lure her to start with ‘mamamama’ but she isn’t quite there yet. 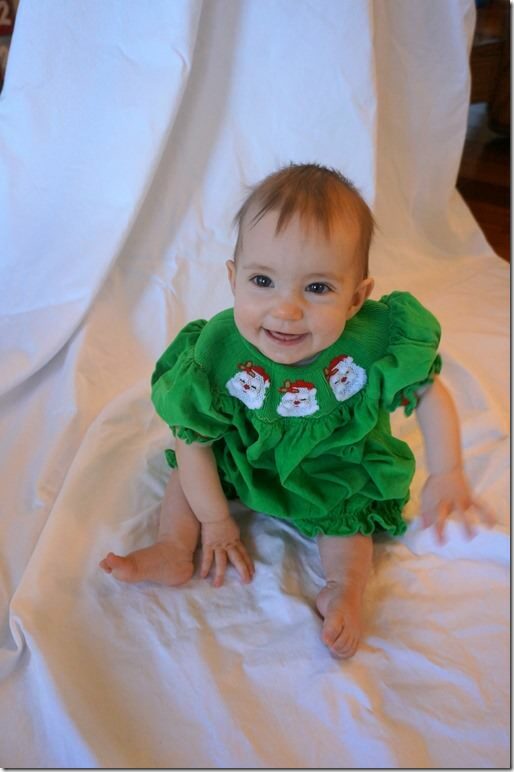 She wears mostly 6 month clothing or 6-9 month. She wears size 2 diaper. She’s a little thing, though I won’t know her official height and weight until her next appointment. No one can make Kaitlyn laugh like Hailey. 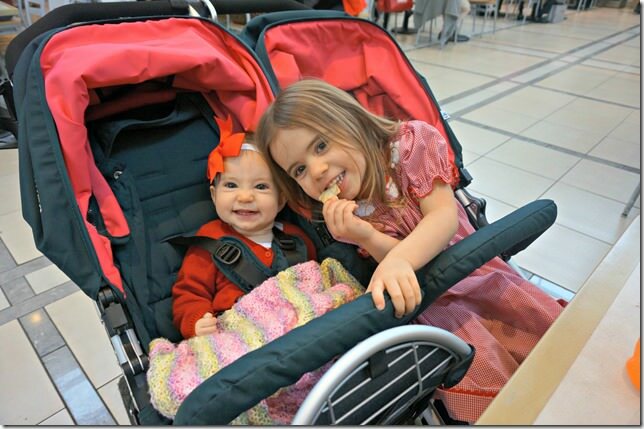 For fun: Hailey at seven months old part one and part two – plus other baby-related posts. 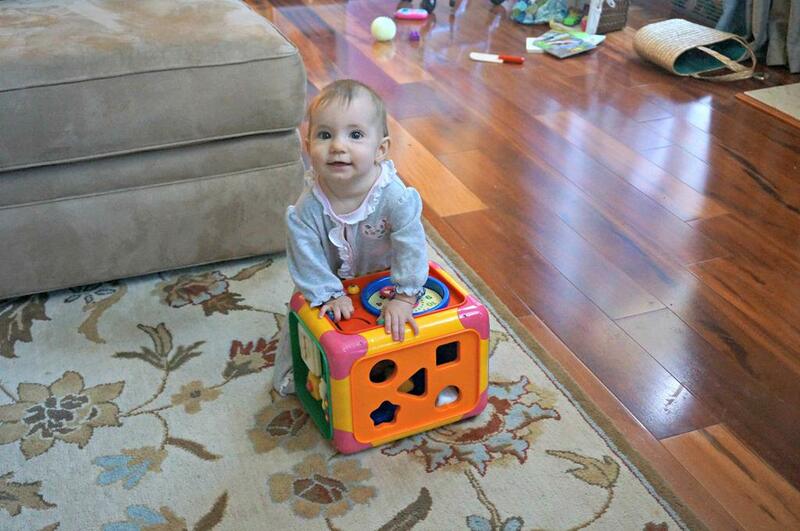 oh my stars… she is getting to be so big and sweet! I just love your two girls! Love the “grandparent” update. Kaitlyn definitely is fun! John J. recently posted..Holidays Are A Good Time To Know The “History Of God”! Oh my, the picture under the tree is so sweet! I love reading these updates. My little guy will be 12 weeks in a few days and I always look to you for your honest experiences and advice. Brynn recently posted..Lately + Big News! Amelia JUST started the uptick in babble a few days ago, and she’s got 9 days on Kaitlyn, so I bet it’s just around the corner! I can’t believe how mobile she is! Looks fun (and exhausting!). Your kids look so adorable! 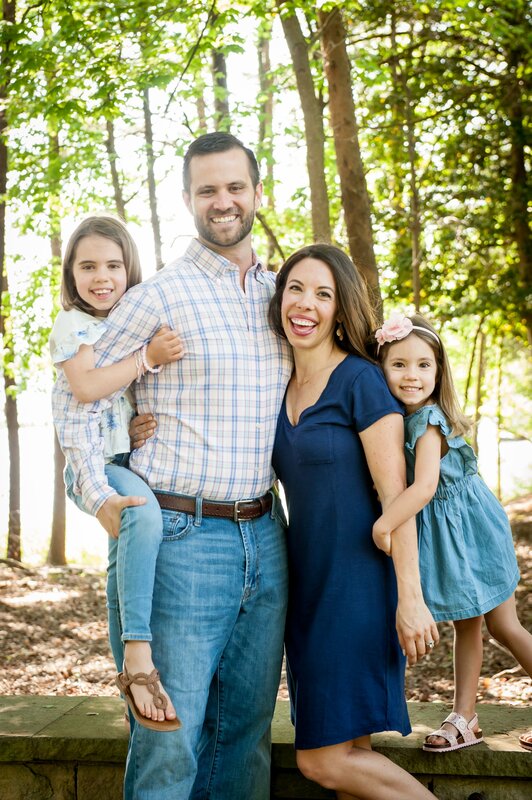 I am a father of three and loving it! Children are such a blessing you forget about sleepless nights! Thanks for sharing! Happy Holidays! So sweet, I can’t believe your baby is already 7 months old, she is perfect! Katie Harding recently posted..Gifts for Men – Oral-B to the Rescue! At around that age, it seems like anything odd (sleep patterns, tummy upset, congestion, general grumpiness) was blamed on teething. So appreciate the updates! 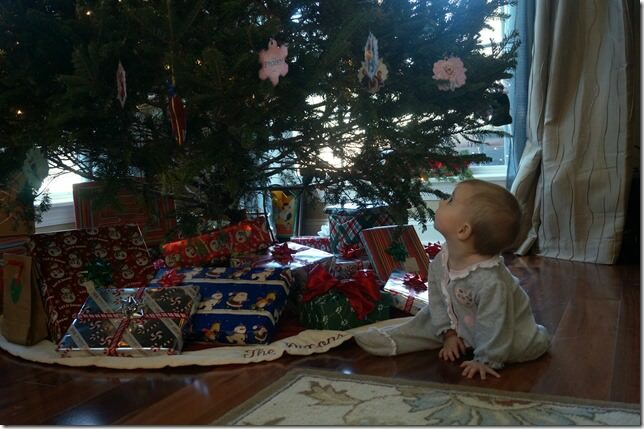 The picture of Kaitlyn under the tree is precious. And I love all the gurgles that come from Kaitlyn when Hailey tickles her. Your girls are adorable! I hope you guys have a wonderful Christmas!